Team perks can be a very powerful way to enhance your hero loadout in Fortnite Save the World. Team perks become available every time you unlock a new Mythic hero and is currently not listed anywhere in the game. Therefore we have found all the available team perks and compiled it into one list. Shadow Stance regenerates 2.7% Shield per second. Eliminations during Night or Evening grant a 0.24% Damage bonus and a 0.08% Melee Life Leech, up to 40 stacks. These bonuses last until Night ends. Recover Shield equal to 0.25% of Energy lost. The Cloaked Star Round Trip Throwing Stars return to you, dealing damage again on the way back. Requires 2 Ninjas of Legendary rarity. Frag Grenades leaves an energized area dealing 12 base Energy Damage per second for 6 seconds. Base Radius is 0.375 tiles and is increased with each match. Wukong Soaring Mantis Gain 2 extra Mantis Leap jumps. Quick-Draw Calamity Hot Swap Weapon eliminations increase Weapon Damage by 13% for 15 seconds. for a time. Each weapon type can apply 1 stack of this effect. 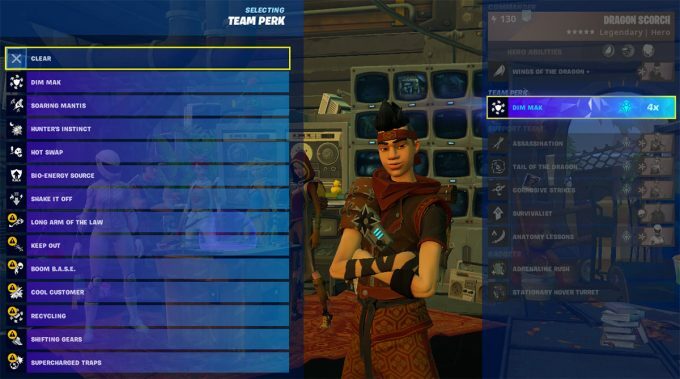 Master Grenadier Ramirez Cool Customer While Stay Frosty is active, using an ability will reduce the cooldown of all the remaining abilities by 3 seconds and end Stay Frosty. Increase Damage against full health enemies with 6.5%. For each enemy nearby, increase Healing Received by 2.5%. Unknown Recycling B.A.S.E generates resources based on affected structures. Higher tier structures generate more resources. Interact with B.A.S.E. to collect. Steel Wool Syd Boom B.A.S.E. B.A.S.E. will blast music, increasing the damage of allies within 5 tiles by 12% and critical rating by 15. Unknown Long Arm of the Law Anti-material charge range is increased by 1 tile. Subzero Zenith Shake it Off Decreased the duration of elemental status effects by 50%. Ragnarok Slow Your Roll Freeze melee attackers for 2 seconds, Mist Monsters are slowed by 43%. Field Agent Rio Phase Blaster After 5 seconds, your next shot will fire a Phase Pulse that deals 47 base energy damage. Phase Shift has 1 additional charge, but the range is decreased by 0.2 tiles. We will add more in the future whenever new Mythic heroes get added to the game. If you see a team perk currently not on our list, please post a comment and let us know!